Bali, frequently referred to as the “last paradise”, is on the bucket list of most travelers. While some destinations with Bali’s popularity turn out disappointingly to be the work of a marketing genius, Bali’s reputation is well earned. It’s beautiful, abundant, stimulating, relaxing, fun, enriching and full of options. With that said, to have a more realistic expectation of Bali, we also need to talk about what is left outside the frame of those mesmerizing photos of Bali. It is hard to imagine that Bali is indeed a very congested, urbanized and crowded island when all you see on Instagram of Bali is the infinity pools stretching out into the lush forest and quiet rice fields at sunrise. In our Bali guide we will try to address both sides of things and help you navigate around them. Bali can be lived in various ways. You can submerge yourself in cultural experiences, yoga, surfing, shopping or in luxuries. It has it all, so it is up to you to decide what you want to get out of Bali. Where Bali is a province of Indonesia and a part of the islands of the Lesser Sunda Islands. The provincial capital of Bali is Denpasar. Bali is pretty much an all year round destination thanks to its tropical climate. All year long the temperature floats between 25 at night to 35 degrees Celsius during day but some months get heavy rain, making them less pleasant than other months. Mid-April to mid-Oct is the best time for Bali. It is mostly dry but in the tropics, you can always expect an occasional rain. More likely in April and October but nothing scary. However, we recommend avoiding the months of August and July as it gets overwhelmingly crowded. Traffic is at its worst, accommodation & rental prices are at their highest, cues are long and early reservations are a must for good restaurants. So aim for the months of April, May, June, Sept, and Oct for the best experience. New Years and Christmas times also get very busy in Bali despite the high chance of rain. Digital Nomads – There is a huge expat community on the island. Some are just passing through while others fell in love with it so much that made it home. There are plenty of awesome co-working spaces, shared housing, Facebook groups which make it super easy to set started. Living costs are significantly cheaper in Bali than in developed nations. Many people happily trade days of metro rides in and out of plazas & cold winters to days of morning yoga sessions followed by smoothie bowl breakfasts and open-air bamboo offices with pools. Mostly they are of professions that can be done remotely, such as graphic designers, programmers, SEO specialists and so on. The key is to have your projects and clients lined up at your home base before coming here. Yoga lovers – Whether you are looking for spiritual awakening or just exercise, Bali is a heaven for yoga lovers. 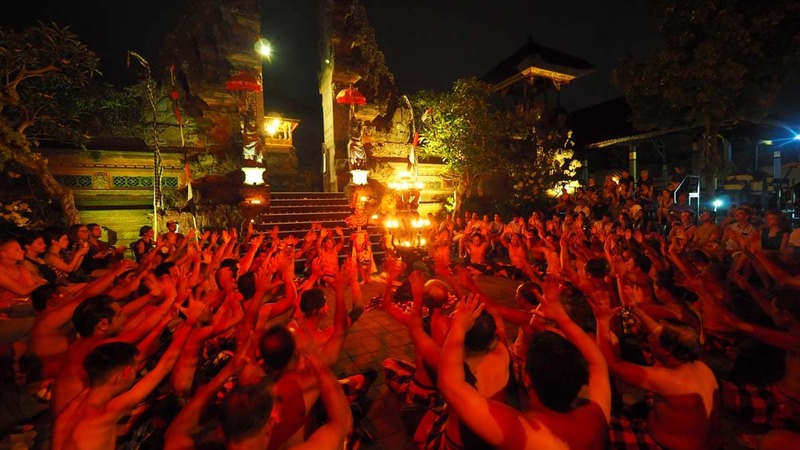 Spirituality is in the fabric of Bali thanks to Hinduism. It is also why there is such an amazing variety of vegan options all over the island. You will find yoga pretty much anywhere you go but without doubt, Ubud is the Mecca of yoga. It has the biggest yoga crowd and widest array of yoga & healing centers and is said to have a special transformative energy (which I didn’t really get). Yoga Barn in Ubud is a world-famous yoga center and the best place to get a teacher’s training. However, if you are more of a casual yogi like myself whose main purpose of coming to Bali isn’t yoga but you like it on the side, you might want to consider The Practice in Canggu. Canggu is a more fun & lifting than Ubud overall. The Practise is also a great yoga center. Solo Travellers – The influx of yogis and digital nomads paved the way for all solo travelers. You just need to plug yourself into one of these communities and you will hear of everything from single mingle nights to bbq Sundays. There is no such thing as being alone in Bali. Surfers – Bali is surrounded with surf spots for all different levels. There is a huge surfer community on the island and numerous surf shops. 1) You can easily afford luxuries to spoil yourself with. 2) It has natural beauty, good food, cultural and spiritual depth, both traditional & modern options, fast internet, super cool cafes & beach bars, great shopping, chill surf vibes. 3) Unlike other tropical honeymoon destinations like islands of Maldives or Seychelles, it is quite big. There is a lot to see and do, indeed even too much, so you never feel stuck on an island. Another pleasant important difference is you are not separated from the locals, you are among them. This makes it so much warmer and culturally very interesting. 4) Best time to visit Bali (July & Aug, but Sept and Oct is good too) conveniently overlaps with the wedding season. 5) The only Hindu island in the Indonesian archipelago, Bali is a world in itself to discover. – If you want to cover everything Bali has to offer, you will need at least 2 weeks. 3 is better. However, if you have less than 2 weeks, that is fine too. 10 days is enough to cover most of the highlights and get a good idea of Bali. You will just have to let go of certain things. – Bali has 3 smaller neighboring islands: Nusa Lembongan, Nusa Penida, and Nusa Ceningan, collectively the Nusa islands. They are great because they are not taken over by mass tourism yet. However, that is going to change fast as Nusa Penida’s gorgeous views exploded on Instagram. They are about 30-40 mins away from the port in Sanur, Bali. Most tourists don’t make it there but in our opinion, if you have more than a week, it is worth sparing 2-3 days for the Nusas. Nusa Penida – Wondering what Bali would be like if tourist never came? You will get your answer in Nusa Penida. 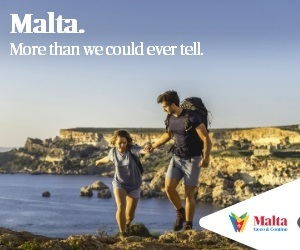 Rugged roads, spectacular views, pristine beaches, world-class diving, few but a satisfactory choice of eateries & hotels. Nusa Lembongan & Nusa Ceningan – Lembongan is a laid-back surf town where you can find anything between modest huts to nice boutique hotels. The two islands are connected by a bridge, so you easily explore Ceningan from Lembongan. Gili Trawangan – Party island. Also great for diving. Mostly backpackers. Gili Meno – Romantic getaway. Best beaches. Mostly honeymooners. Gili Air – A mix of the other 2 Gilis. Canggu ♡ Cool surf town, hipster crowd, a hub for digital nomads 3 days for Canggu, Seminyak, Kerobokan together. More if you are surfing. These 3 areas are very close to each other. It makes sense to book in one place for 3 nights and just travel around with a scooter. Kerobokan / Berawa Squeezed between Canggu and Seminyak it is a little bit of both. Plenty of luxurious villa residences. Cool hangouts but less chaotic then Seminyak. Kuta Bali’s first and biggest tourism spot. It is the capital of nightlife in Bali but the quality is quite low. Unfortunately, it is a town that lost its charm to mass tourism. 0 days unless you are 18 and you came to Bali to get wasted on cheap booze. Jimbaran Seafood Neither the town nor the restaurants are really tempting. When Bali has so much to offer, it is better to invest your time elsewhere. Ubud ♡ Rice terraces, lush jungle, infinity pools overlooking the jungle, yogini & digital nomad hang out. Bali’s cultural hub. Overwhelmingly busy. Most people just stop for a few hours for the dolphins. 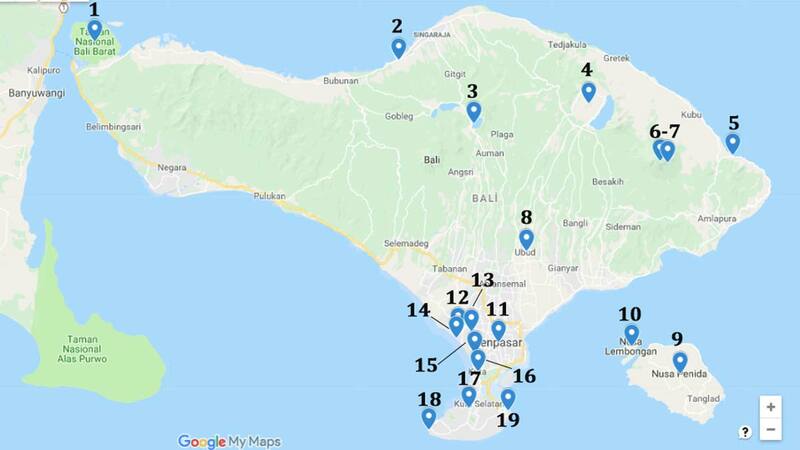 Amed Top-notch diving sites It makes sense to do Amed on the same trip as Karangasem as they are very close. Lempuyang and Tirta Gangga are quick to see but since getting there takes time. For an unrushed trip, you need 1 day for sights and 1 for diving. If you are not into diving, you can simply do a day trip to Karangasem and back. Karangasem (East Bali) Lempuyang Luhur, Bali’s most sacred mountain, is here and it is some to the famous Lempuyang Temple. Tirta Gangga, the former royal palace is also in the region. This is where people usually go if they want to spend a few days in a nice hotel in a calm place. I personally prefer Uluwatu for such a romantic & chill getaway. On the other hand, Uluwatu and Nusa Dua are quite calm. If you prefer a luxurious stay in lively town Kerobokan & Seminyak might suit you better. West Bali National Park The less discovered part of Bali. Serene beaches & wild nature. Also a surf spot. Most authentic part of Bali. You would need 2-3 days here. Most people don’t go there unless they have more than 10 days because it is very removed from everything else. The Gilis ♡ Dreamy beaches, great for both swimming and diving The Gilis don’t really have points of interests. How much time you need is a matter of how long you want to hang out. ♡ represents our favorite places in Bali. That makes 12 days. For the remaining 2 days decide according to your interests. Want to try learning surfing? Add a few days to Canggu or Kuta. Want to romantic finale? Consider Nusa Lembongan. Want to dive? Go to Amed. You get the idea. Our table above should have given you a rough idea of what the ideal itinerary would be for you. However, to make sure that you are not missing out on anything big, take a look at our Top 27 Things To Do In Bali list. Since distances aren’t that big in Bali, so in some cases it makes sense to do day trips from your hotel instead of packing and unpacking every day. If you want to do both trips, we recommend staying at Lovina one night. See our Ubud guide for more information. If you want to do both trips, we recommend staying at Amed one night. See our Ubud guide for more information. One of the best things about Bali is that even on a budget you get great service and when you want to spend more, you always end up feeling you got your money’s worth. Here is a brief summary of what money can buy to help you plan your budget. Remember accommodation costs rise drastically in June, July, Dec and some in Jan too. There are some great venues, even some with exceeding reputations like KU DE TA but still, nightlife isn’t Bali’s strongest muscle. The locals sleep & wake up early, setting the pace for the entire island. To our surprise, most nightlife takes place on the beach clubs, starts at sunset and ends around 23.00 or 24.00. I blame it on the honeymooners who prefer to snuggle at night than a party (myself included). 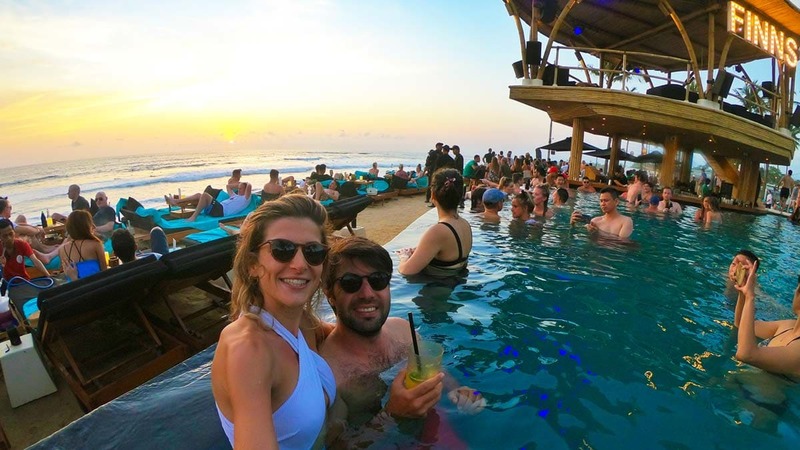 😀 However, the sunsets at the beach bars are so great that they are on everybody’s top things to do in Bali list. The pleasure of sipping dragon fruit margaritas while watching the sun disappear into the sea from the pool bar is just unbeatable. Seminyak being the upscale choice and Canggu being the cooler, have the best nightlife in Bali. Motel Mexicola and La Favela are a must in Seminyak. If you like Berlin style parties, head to Pretty Poison in Canggu. This skate bar is just too cool! Of course, there are plenty of other beach clubs and bars to check out, even enough to keep you busy for one whole month. Here we provided a short list of the best ones because most people don’t have that kind of a time. You can simply click on our city guides from the Quick Look table below to read or full lists. Kuta is known as the party capital of Bali but it caters mostly to a spring break-minded young student crowd. If trashy music and cheap buckets aren’t your taste, I don’t recommend going there. My advice is to just skip Kuta overall. Last but not the least, Omnia and Finns beach clubs host events with mind-blowing line-ups. Make sure to check online. You can always expect to find a cool party on special days like Halloween and new year’s eve. Check out our Bali’s Best Beach Clubs & Sunset Bars for more options. 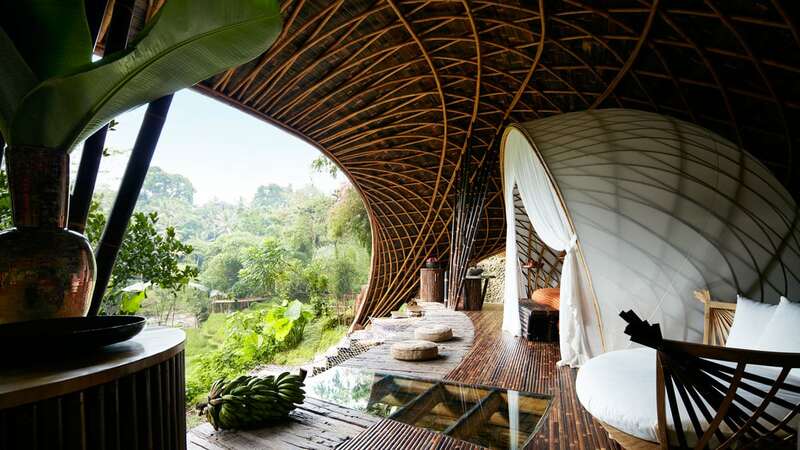 Bali is home to some of the world’s most special houses and hotels. They are out of a fairytale. If there is one thing that can compete with the magic of them, it is the Disney movies. So if you are on honeymoon or a romantic getaway, you should definitely consider booking one them for a few nights. The only problem is that they get booked months in advance. There is also a few of them. You will find our favorites in Best Honeymoon Hotels in Bali. Bali is completely different than the 17,508 islands of the Indonesian archipelago. Hinduism and isolation had allowed the development of a very unique culture where vibrant religious beliefs found expression in dance, music, arts and everyday rituals that were created to please their Hindu gods. This has been both Bali’s blessing & curse, putting Bali in the spotlight maybe too much for its own good. First frequenters were researches and artists in the 1930s. Bali back than was so removed from the rest of the world, living in its cocoon, almost like a tribe. You must definitely check out this video of Bali in the 1920s. As the word spread out about Bali being so pretty, exotic, inspiring and welcoming, by 1970s it had exploded. Of course today Bali is nothing like you see in this video but they still hold on strongly to their culture. While most Balinese speaks English, wear jeans, listens to indie hits on Spotify, they still prepare offerings every day for their gods, religious festivities are still vibrant and Balinese art is booming thanks to foreign buyers. Tradition and religion are still the two pillars of society. So if you are interested in Bali for arts & culture, you will find plenty to keep you busy. Bali has stunning beaches however your enjoyment of them is pretty much limited to staring at it unless you are a surfer. Life under the sea is also quite spectacular but waves can make snorkeling an uncomfortable experience. Well, at least the surfers are having fun. Most of all earthquakes in the world happen in Indonesia. For Balinese people, earthquakes are as ordinary of a natural phenomena as rain. Buildings are small so they don’t pose much of a danger. What is more worrisome than the earthquake is the tsunami it may create. Gili islands were evacuated in 2018 because they are very vulnerable to tsunami. 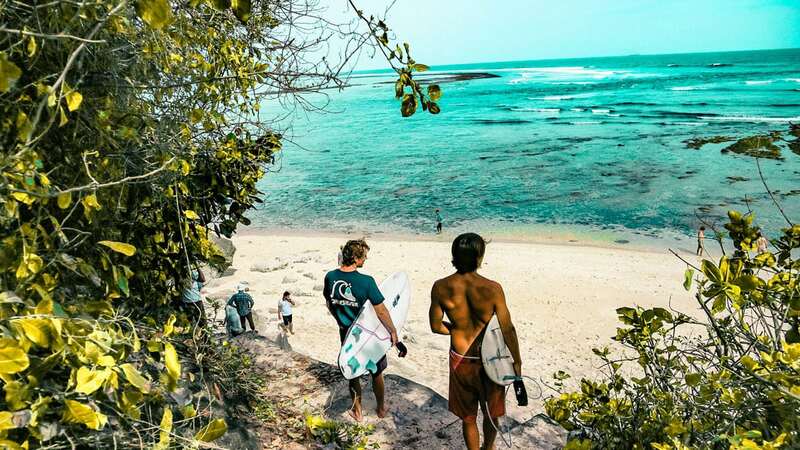 Bali is just as much at risk as the Gilis but luckily, most of the Bali isn’t as flat. After an earthquake, if you are at the sea level, you have some minutes to get yourself on a hilltop before a tsunami hits. Don’t panic, not all earthquakes result in a tsunami. However, it is a good idea to pay attention to the tsunami evacuation signs you will see around the island, just in case. See tsunami zones and evacuation plans here. Finally, Indonesia is also home to a third of the world’s active volcanoes and Bali’s Agung volcano isn’t exactly shy. It wakes up time to time and frightens people. If there is a mood spoiler in Bali, it is the hustle of getting around. For one thing, there is no proper road network. You will often find one road between two points with dead-end streets branching off of it with no alternative routes. Inevitably, when 4 million locals and hundred thousands of tourists try to drive on the same road, you get a massive traffic jam. To make matters worse, there is no public transportation. We will get to your option in a little bit under Getting Around In Bali. Money exchange scam: When you are exchanging money, you hand in your dollars, they do the conversion, take the amount in rupiah, verify it in the machine, count it before your eyes and -this is where the problem happens- hand the money to you. Since it has been counted before your eyes and it is a big bulk of bills, you don’t feel the need to check one more time and put it in your pocket. What you don’t realize is that their quick hands removed a few bills. This is a very popular scam. Obviously, the best way to avoid it is to count your sum right then and there & to choose trusted dealers. Don’t be fool by the “authorized” signes as most are self-titled. Some of the trusted exchange chains are Wahana, PT Central Kuta, Dirgahayu Valuta Prima. 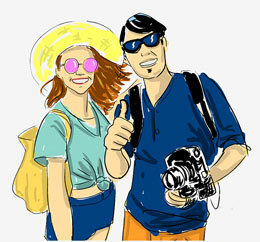 Unnecessary guides & fees: Sometimes the locals will insist that it is obligatory to hire a guide or pay an extra fee to visit some place when it isn’t true. If it doesn’t write in a guide or on an official sign, it may be a scam. Rental return scam: Upon returning your bike, they might ask you to pay for the scratches and dents that was already in your motorbike. When you are renting the scooter, make a video of the bike and make sure that the dealer is in the video of some sort. This way you can prove that the damage was already there when you got it. 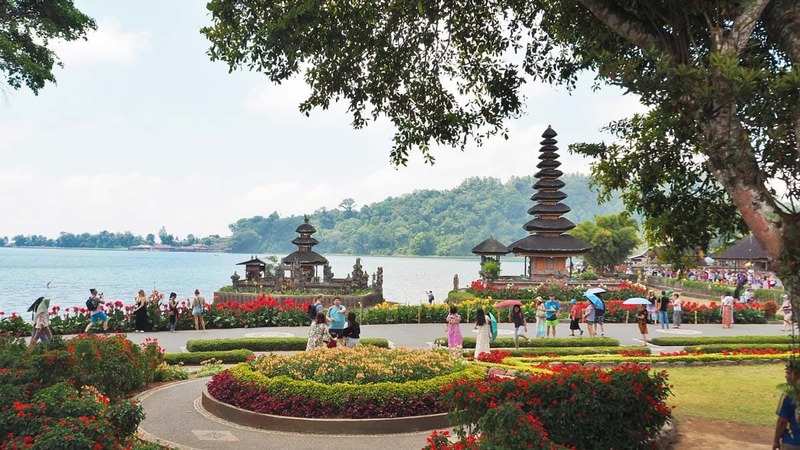 There are plenty of flights from all around to Bali’s Ngurah Rai International Airport in Denpasar but Singapore Airlines has the wisest offer. They allow you to stop over in Singapore as long as you want making it possible to see 2 countries for the price of one ticket. 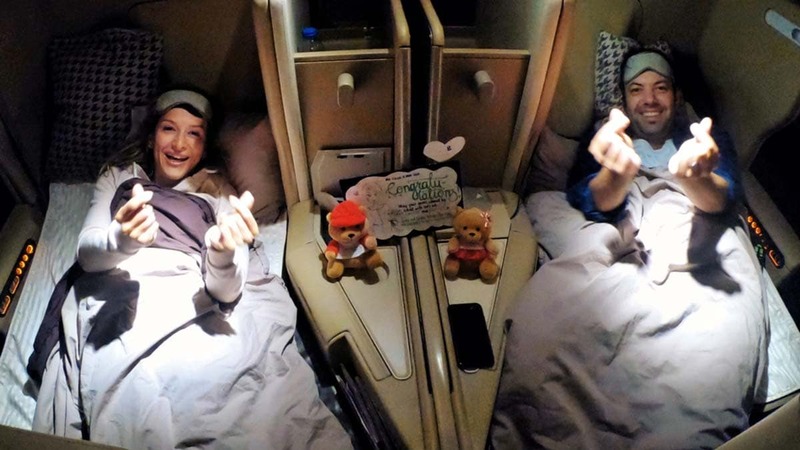 Their business class is exceptional and a great way to land jetlag-free. They are repeatedly chosen the world’s best. We can say that some of the best dishes we had on our Bali break were actually served on the plane, prepared by the airlines celebrity chefs worldwide. A small and helpful reminder: They also provide 20 Singapore Dollar vouchers to each passenger usable in the airport shops however you need to go a desk to get them. Information booth will point it to you. 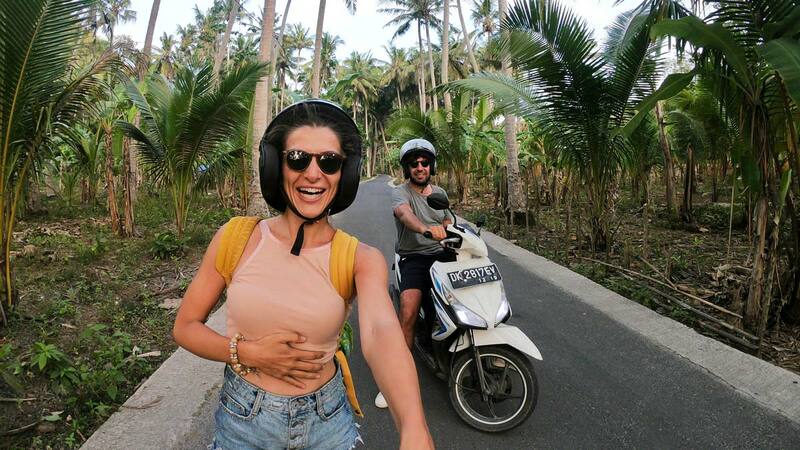 The golden key to unlocking the pleasures of Bali is renting a scooter. It is much faster than riding in a car because you can make way your up the traffic by using the spots between the cars. It costs around 50K-70K IDR depending on the bike’s condition. Gas is pretty cheap, too. Although you supposed to have the driver’s licence to ride motorbikes, you are not asked to declare it when you are renting. With that said, if you don’t have much experience, Bali is no place to get it. Driving in Bali can be tricky and dangerous. Indeed, a lot of tourist get in motorcycle accidents. Also, if you are from Europe or the States, the fact that traffic runs on the left side can be confusing. Still, it is by far the best way to explore Bali. 1. It is treated as there are 2-3 invisible lanes within a lane for motorcycles. The traffic is flowing faster on the right, and slower on the left like on a highway. Most accident happen because an unexpected tourist does a slight right or left and gets reaped by the approaching motorcycle behind. Stick to the left side of the lane and never zigzag around. 2. It is definitely worth paying a little extra for a better bike. Especially if you are 2 people, it is better to get a good bike. 3. Try to rent from a place with good helmets. Also, you will get stopped by the police if you are not wearing any. You can ask the front desk of your hotel to get you a cab. Taxis in Bali are famed for ripping tourists off. They play all sorts of dirty tricks such as swapping your 50 with a 5 to pretend you need to pay more or not resetting the meter after the previous customer. There are a bunch of taxi companies but most tourist use Blue Bird Taxi as they have built up a reputation for being honest. Grab is the Uber of Bali, providing both car and motorcycle rides. They take up to 2 passengers on a bike. Grab is a great app to have on your phone even for just checking out the tariff between 2 spots, like Seminyak to Ubud. Do not expect Grab’s rates from other providers, their rates are usually unbeatable. However, Grab drivers can also be scammers. We ordered a car and selected pay by credit card. The amount was immediately charged but the car never came. Indeed, the driver started texting us to pay him 3 times more in cash to pick us up. 1) Get a local number and use it to register on Grab. When you are registering, use a Balinese name such as Wayan Karja. 2) When you are ordering a car, always choose to pay in cash. Do not put your credit card info in the app. 3) After placing your order, the driver may call you. Make the local such as the receptionist talk to them. If you are doing day trips and you can’t drive a scooter, your best bet is to hire a car from a local tourist agency. You will see their stands or shops on the main streets. Since cars are very precious in Bali, they mostly rent it with a trusted driver. It costs about 50 USD/day. He will drive you, show you around and even take photos. Bemos are minivans without seats. Instead, there are wooden benches to fit more people in. They are also knowns as angkots. They ride on set routes which can make it redundant sometimes because you need to catch a private ride to get to them. It makes more sense to use it in Southern Bali. The divers will always overcharge tourist. Ask how much the ride will cost before getting in and be ready to negotiate. Most people can’t be bothered with the haggling just get a Blue Bird. Your best bet is getting a Grab. Taxi drivers hate Grab for stealing their business and block them from entering the airport. So they wait discreetly in the parking lot. The driver will give you directions about how to find him.